The entire deck is made from 1-inch by 2-inch rectangular steel tubing cut to different lengths and powdercoated with a gloss black, textured, hammer-coat finish. 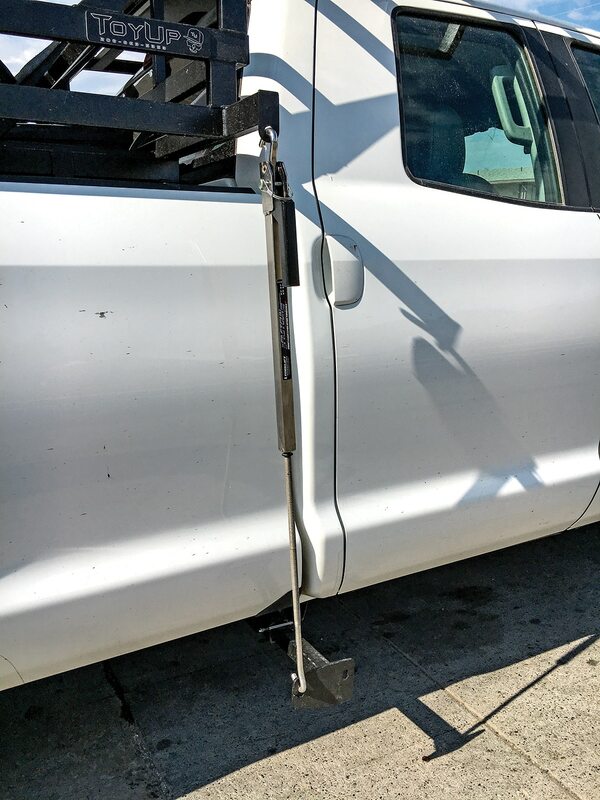 Adjustable steel turnbuckles hold the deck into your truck, attaching to the four factory tie-down points. Twelve-foot folding aluminum ramps hook on the far rear of the deck and allow you to drive any car up onto the deck. It’s not as hard as it looks. On the trails, everyone drives up steeper inclines than this. 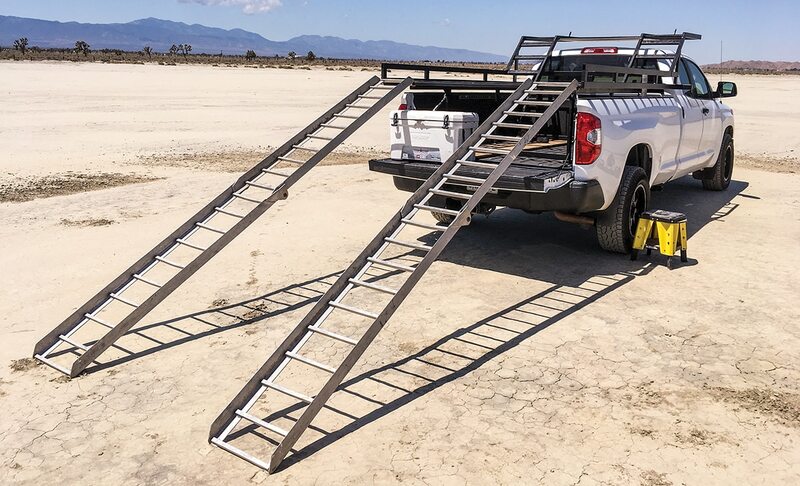 The folding aluminum ramps are 12-feet long so your loading incline isn’t any steeper than you find on the trail. For an added bonus, our deck was delivered with a 27-inch by 38 1/8-inch-thick aluminum storage platform large enough to carry a spare tire or a big plastic storage box. Brackets are provided as well to mount up to a 50-inch-wide LED light bar. ToyUp Industries makes ATV and sled decks as well. Each deck is made to the dimensions of your brand of truck, depending on box size and cab height. The deck will fit any Chevy, Ford, Dodge or Toyota full-size truck and even some mid-size trucks. ATVs or UTVs that are 50 inches up to 74 inches wide can fit on the deck. You can use them on a lifted truck. The highest vehicle we have loaded on our truck reached just under 12 feet high at the roof. Highway overpasses are all 14-16 feet. Of course, in a small town or private driveway, you may have an overhang that is lower. Your car will easily clear gas station overhangs but not most fast-food drive-thrus. After we load a vehicle, we take a measurement and write it on a piece of tape on the sun visor in the truck for reference. 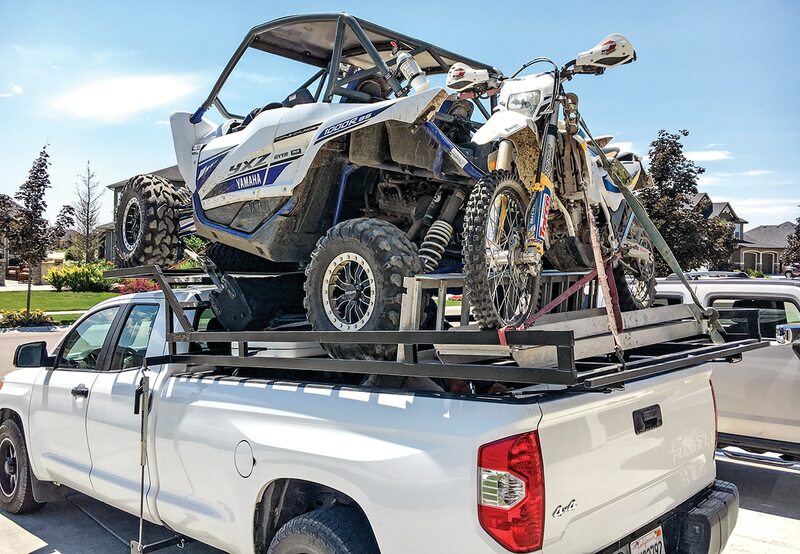 If you bought your UTV to turn heads, there’s no better way than to haul it 12 feet in the air over the bed of your pick-up. Carrying a SxS up there is actually easier than hauling a large cab-over camper, and in most cases it’s lighter and creates less wind resistance. In the last six months we have carried a Yamaha Wolverine X4, YXZ1000 and several X3s on the ToyUp UTV deck. We have driven thousands of miles, and it’s performing flawlessly. You hear a little wind noise from the deck, and yes, you do feel the weight of the car on top. The truck sways a bit, and you have to ease your starts and stops a bit more, just as you would towing a trailer. To reduce body roll on our Toyota Tundra, we installed a Hellwig (www.hellwigproducts.com) rear sway bar and airbags. You can also use cab-over-camper front attachments for even more support. We are using the Torklift (www.torklift.com) brand we picked up from a Lance camper dealer (www.lancecamper.com). This gives you an extra mounting point up front that attaches directly to your truck’s frame. With a larger 3/4-ton truck, you wouldn’t need these extra products, but they do help. During loading, we place a motorcycle stand right near the truck tire to step up to the bedside when it’s time to strap or unstrap the car. Torklift camper mounts provide an additional attachment point directly to the truck’s frame. Four turnbuckles hold the deck inside the truck bed. A Hellwig rear sway bar and airbags help stabilize the 2000 pounds of weight we typically haul. For hauling one machine without a trailer, you can’t find anything better. For traveling with multiple vehicles, this is a great alternative to a super-long flatbed or enclosed trailer. 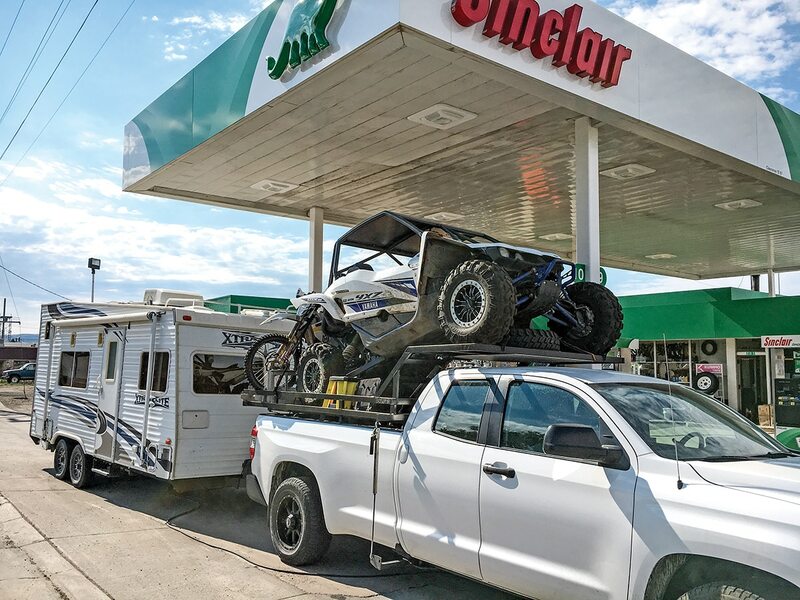 The ToyUp UTV deck helped us avoid buying a bigger toy hauler and a bigger truck to tow it. That savings paid for the UTV deck 10 times over. We love it. PRICE: $2595, 7-foot or 8-foot; $2695, 9-foot; $2395 for a 9-foot flat deck.